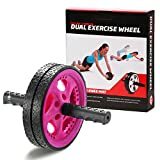 GALLANT AB WHEEL ROLLER EXERCISE – Best Core and Upper Body Toning Exerciser Made to Strengthen and Tone Abs, Back, Arms and Shoulder Muscles. MADE WITH HIGHEST QUALITY MATERIALS – Stylish Silent Dual Turning Roller Wheels With Metalic Axle. THICK PADDED SOFT CUSHION HANDLES & THICK KNEE PAD – They provide Excellent Grip and Stability While Rolling. Thick Knee Pad Provides Comfort and Support to Knee While you Roller on any Surface. EXCELLENT MONEY BACK WARRANTY – Simply Try ‘Gallant Premium Ab Wheel Roller’ and If your not Pleased then Return to Claim you Money Back! Gallant ® Ab Roller Wheels With Knee Mat Abdominal Exerciser. Work your abs with this great Ab Roller. A great way to tone and strengthen your core muscles. Ab Roller full range moment ensure stretching and contracting your abdominal muscles. It also help grow arm, shoulder and back mucles to allow a complete full body workout. Lightweight and portable design made from robust plastic for long lasting use. Anti Slip Dual Core Wheels to provide smooth and stable motion. Foam padded Knee Mat has been specially made to provide comfort and support to knee when using ab wheel.